Did you know that businesses that blog generate 67% more leads than businesses that don’t? It’s true. 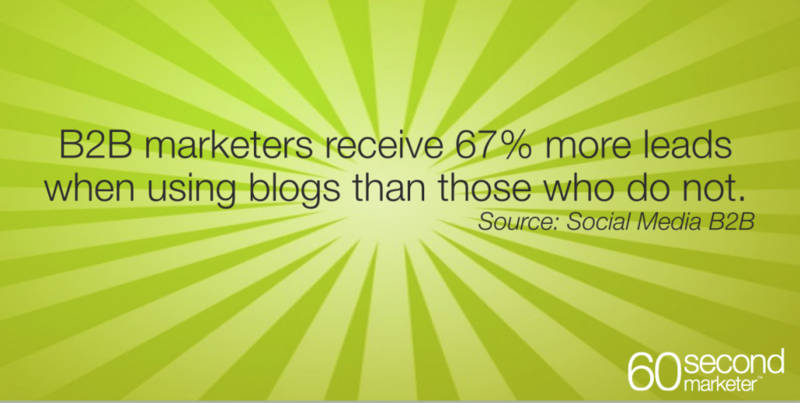 And it’s just one of the many reasons blogging should be part of your overall integrated marketing program. All that said, blogging won’t magically generate a flood of leads for your business. In fact, it’s just one of about 10 important tactics you should consider when trying to generate leads. But it’s one of the more important tactics, so with that in mind, let’s take a dive into what makes a good blog and how you can use some simple techniques to supercharge your next blog post. What are you trying to accomplish with your blog post? As mentioned above, blogging isn’t going to magically drive leads to your business, but it can help you 1) establish yourself as a thought leader, and 2) provide information to prospects who are in the middle or the bottom of your sales funnel. Here’s a model of some of the tactics that can be used to drop prospects into the top of the sales funnel and nurture them along a path until they become clients or customers. You’ll notice we’ve put blog posts are in the middle of the sales funnel since most people reading your blog are probably already familiar with your business. Because of that, blogging is something that’s often considered a middle of the sales funnel tactic. Remember, just because you’re using tactics like blogging and email marketing to nurture prospects through your sales funnel doesn’t mean that you’ll close deals right away. In fact, if you have a B2B product or service that costs more than, say, $1,000, then you’ll typically need a sales person to close the deal. In other words, the tactics outlined above are good only for driving leads to your sales force. In the end, the sales force is going to have to go the final mile and close the deal. At the 60 Second Marketer, we use our blog to generate awareness for my speaking services and for my marketing consulting business. That one-two punch of establishing thought-leadership with the 60 Second Marketer blog and then using my speaker website to further establish my credentials has worked out well for me over the past year. Okay, now that we’ve got some of the fundamentals out of the way, let’s take a deeper dive into some of the specifics of writing a blog post. “How To” Posts: This is the kind of post you’ll see most often on sites like the 60 Second Marketer, RazorSocial and Hubspot. It’s the most common kind of post and is a great way to engage readers and build traffic to your site. The challenge is that so many people are writing these kinds of posts today that it’s hard to break through all the clutter. But with the right spin, the right tonality, and the right content, you can use this format to carve a niche for yourself. Strategic Insight Posts: Seth Godin is the king of these kinds of posts. For a while, I stopped reading his posts because … well, everybody needs a change now and then. But the truth is that he does have some super valuable insights. Even though his posts are super short, you’ll walk away from every single one with a thought-provoking idea and some insight you can apply to your business. Point-of-View Posts: Michael Hyatt uses a blend of How To and Point-of-View in his posts, and he’s a master at it. Generally speaking, his content provides tips and techniques, but he adds his point-of-view on why those tips and techniques are relevant to you or your business. Totally worth checking out. 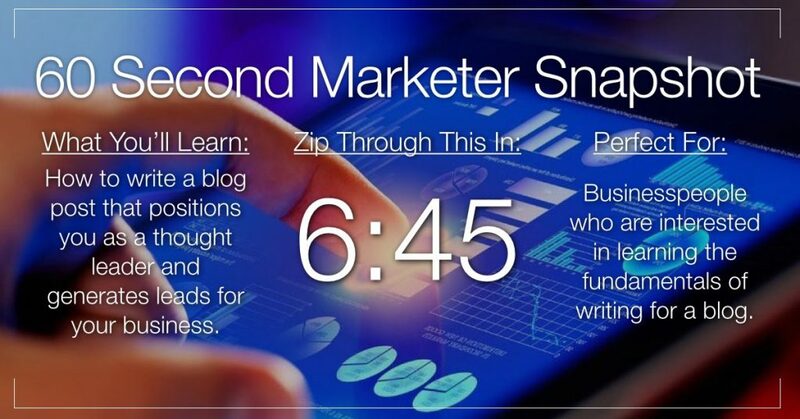 We spend a lot of time at the 60 Second Marketer trying to make sure the first few lines of a blog post speak to the reader in a way that is distinctive from other blog posts. We don’t always get that right, but we try to accomplish it every time. If we don’t, then a phone call, an email, a text — or another blog post — will distract the reader from finishing our blog post. In order to make sure your first paragraph grabs the reader’s attention, get inside their mind and think backwards. In other words, put yourself in their shoes and then work backwards to your business solution from there. By doing so, your blog post will talk with them rather than at them, which is one of the key differentiators between a good blog post and a great blog post. What can you do to make sure you’re talking with your reader instead of at them? Glad you asked. Who is the human being I’m talking to? What’s on their mind, other than my post? In other words, what’s distracting them and what’s got them worried at work? What pain point will my post solve for them? How is what I’m about to tell them going to solve those problems? Additional tips and techniques that will help you as you write. Now that you’ve thought through what kind of blog post you’re going to write (e.g., How To, Point-of-View, etc.) and you’ve gotten inside the mind of your reader, you’ll want to begin the process of writing your blog post. Provide Actionable Information: At the end of your blog post, the reader should come away with several action steps. A common mistake most bloggers make is that they just provide information, but great bloggers provide information as well as insights. And the very best bloggers provide information, insights, and action steps. By closing the gap between information and action, you’re giving your reader something to do after reading the post, which is a great way to stay top-of-mind with your customers and prospects. Use Graphics: You’ll notice that most of our blog posts include graphics of some sort. This is because the vast majority of your readers won’t actually read the full post. In fact one study by Neil Patel found that only 40% of readers finished a blog post. The remaining 60% simply skim the headline, the crossheads, and the graphics. In order to remain top-of-mind with the 60% who just skim your post, include graphics that have information and data that supports the premise of your post. Incorporate Lists and Numbers: Other studies about blog readership show that people tend to click through on posts that have lists or numbers in them. Lists and numbers telegraph your reader that you have a quickly-digestible post that they can put to use right away. You don’t always want to do list posts because that can get boring, but it’s a good idea to upload them to your site on a regular basis. Keep the Tone Casual: As mentioned, you’re goal is to have a conversation with your reader. So be sure to start your post as though you’re in the middle of a conversation. Instead of starting with a high and mighty statement from above, start with something simple like, “Have you ever wondered why…” or “If you’re like most of our readers….” or “Wouldn’t it be great if…” or “Not long ago, I was…” All of those lines tell the reader that you’re talking with them, not at them. Ready to get started? Here’s a step-by-step guide. We’ve covered a lot of ground here, mostly because I wanted you to understand the purpose of a blog and the fundamentals of blogging. But if you’re like most people, you’re interested in actionable information to help you get started. Figure out when you do your best writing. For me, it’s in the afternoon, after my brain has spent the day formulating sentences and organizing thoughts. For you, it might be different. Either way, figure out when you do your best writing and try to do it during that time. Block out a couple of hours. You won’t write a good blog post if you’re constantly being interrupted. Make sure you have a few hours of quiet time to write your first draft. Organize your thoughts. Personally, I don’t write an outline prior to writing a blog post, but I’ve also written two books and 1,000 blog posts so there’s a lot of stuff organized in my brain already. The odds are pretty good you’ll want to create an outline or at least organize your thoughts on a piece of scrap paper before you get started. Eventually, you can skip that step, but unless you’re a seasoned writer, you’ll probably want to do a rough outline first. Get inside the mind of your reader. As mentioned above, the more you understand your reader, the better your blog is going to be. Have a beginning, a middle, and an end. It seems painfully obvious, but it’s worth noting that a good blog post starts with a fundamental premise (e.g., new research shows businesses that blog are more profitable; lessons I’ve learned running a Fortune 500 company; etc.). Once you’ve outlined your premise in your blog post, you’ll follow that with content that supports the premise, and then wrapped up with a summary or action steps. It’s a 1-2-3 approach that works just about every time. Write like you talk. Writing for a blog is much more conversational than the writing you did in high school or at the University level. Write as though you’re having a cup of coffee with a friend. 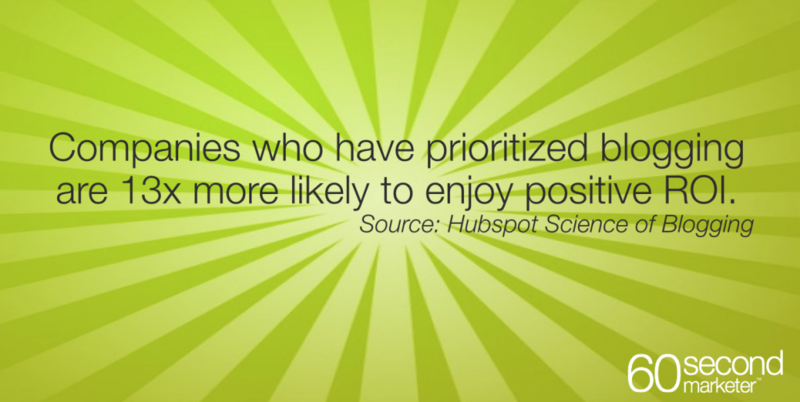 By doing so, your blog will be read, digested, and shared with others. Provide supporting data and information. Did you notice the graphics in this blog post? I wanted to provide outside research and information for our readers so that they knew that this was an authoritative blog and not just something we do haphazardly. Spend time crafting your crossheads. Most people don’t read blog posts, they skim them. With that in mind, make sure your crossheads and bullet points are well-thought-out. Don’t just write “Blogging” or “Tips” as a crosshead. Instead write crossheads like the ones above which are designed to either provide information/insights or to draw the reader into the bullet points below the crosshead. Write it once, then step away. Unless you’re an experienced writer, it’s not a good idea to write a blog post and then instantly upload it. Instead, write it, then re-visit it a day later. By doing so, you’ll spot a lot of things you can smooth out and fix that you didn’t catch the first time. Don’t freak out — it’s just a blog post. In the end, a blog post is just a blog post. In other words, it’s something that’s going to be here today and gone tomorrow. With that in mind, relax and share your thoughts and wisdom with your readers. If you don’t like it, you can update it the next day and hardly anyone will know the difference. The first paragraph in your blog should cut like butter. It should invite the reader in and ease them through the first section of your post. All that said, don’t get hung up on the first paragraph when you write your post, otherwise you’ll get writer’s block. Instead, write a place-holder paragraph, then come back after you’ve written your blog post and re-write the introduction. It’s a great way to get past the writer’s block that so many writers suffer from. I hope the techniques above are helpful for you. If I’ve missed anything, feel free to share it with our readers in the comment section below. We always like hearing from you. About the Author: Jamie Turner is an internationally recognized author, speaker, and CEO who speaks about business, digital media, and leadership at events, conferences, and corporations around the globe. He has been profiled in one of the world’s best selling marketing textbooks, is the author of several business books, and can be seen regularly on network TV news. He can be reached at +1-678-313-3472 or via email at Jamie.Turner@SIXTY.Company.